I met this love-filled leaf on a treacherous patch climbing a hill in Pune. It said hi and allowed me to take its photo. Isn't it spreading a good message? bella foto, la naturaleza nos habla!!! What an incredible find. 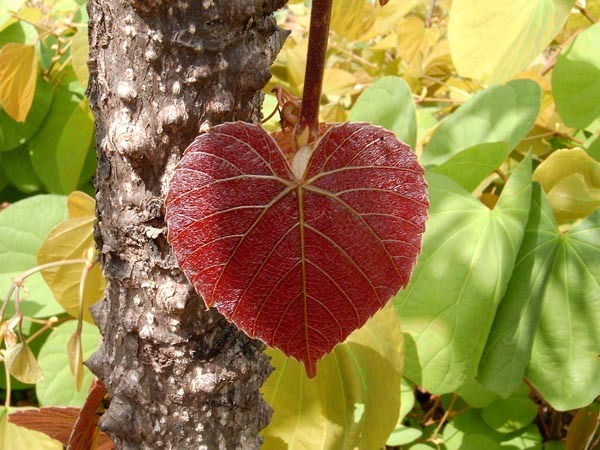 To find a leaf in the shape of a perfect heart....wow! Even nature knows, right? Ahhhh, I just love this! To always keep a new heart! I love this beautiful heart! May I borrow it to post on my 'Random Hearts' blog? With credit to you, and a link back to this site, of course? Awesome Photos even the nature has to remind us about love and care which many of us have forgotten. The heart of the forest, Bhavesh! Wow, that is truly a wonderful find. Wow! That is easily the most incredible leaf I've ever seen Do you know what kind of tree it's from? Bhavesh: You captured the red leaf in a special way, nicely done. It is, indeed. And you have quite an eye to have noticed. What a gorgeous capture, Bhavesh! The color and the shape and veins - so perfect! This is beautiful. I found your heart on Clytie's Random Heart page. This is a first! A heart from another heart page on Sissy's blog! But of course, I see why, this photo is exquisite. It fills my eyes, which is the greatest compliment I can give. What a great contrast against the greens and browns. Another beautiful nature shot. That is a perfect capture of that leaf. What a beautiful picture. Just think, artists study and practice for years to create beauty, and it isall around us in nature, if we just look. Thanks for the kind comment on my blog yesterday!! Found this photo at Clytie's page -nature is so amazingly beautiful! awww! this is so pretty!!! :)) rare shot!